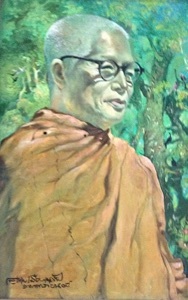 The original Idappaccayatā Dhamma discourses were delivered to the monks and laypeople at Suan Mokkh during the three months of the 1982 rains retreat. Buddhadāsa began to do this sort of thing at some point in his later life, taking a base subject and weaving it into, usually, twelve Dhamma talks. With this series it was felt that two of the talks were unsuitable for translation while one other would have been of little general interest. And one, the ‘Void Mind’ discourse was interrupted by a rain storm and had to be continued on the following full moon night, so it became two talks now made into one. Thus there are eight talks. He was an original thinker and an outspoken critic of much of contemporary conservative Buddhist ideology. Tan Dhammavidu considers his principal duty that of understanding the important works of Buddhadasa and translating them into English. “I’ve listened to his talk a lot over the last ten years or so. Every day - I’m always listening to him… to me, Buddhadassa has got something to say. People need to hear his voice. And need to hear it in a way they can understand… they need a sensible explanation of what he had to say. This guy was really deep, he was a real genius.” - TDV.